It's hard to believe it's been nine months since The Saturdays released their poptastic sophomore album Wordshaker. However, in the months that have passed since October 2009, the group have only released two singles from an album just brimming with potential singles (the first of which, "Forever Is Over", being released nearly a year ago, and the second, "Ego," this past January). While both were hardly terrible songs, I think we can all agree (especially when it comes to "Over") that Wordshaker contained many other songs that were just as good if not better choices for followup singles. "Lose Control" was one of them. "One Shot" was another. "Denial" is yet another. Due to the fact that Fascination Records continually never listens to my call to arms (if this wasn't the case, Girls Aloud would have always remained a working unit five-piece), my favorite song off the record, the album's title track which was also used as a "preview" song during the group's tour before Wordshaker was released, was left to collect dust on the back burner instead of being the girl-powery summer anthem it so desperately deserved to be. I adored everything about this song (and still do in present tense), so much so that I made it #5 on my list of the Top 2(00)9 Songs of 2009. However, my screams for this to be their formal introduction to American soil has seemed to go on to deaf ears, as I have come to accept that "Wordshaker", the song, will never be released as a single. It should have gotten the single treatment if for that acapella chorus bit only. Hurumph, I say. Hurumph, Hurumph. Instead, now we've gained wind that the girls Satz are going the way of Lady Gaga, Miley Cyrus, Justin Bieber and countless KPop groups before them by releasing a mini-album EP, Headlines, set for mid-August. The EP will feature eight songs total, five of them brand new. The three carry-overs are "Forever Is Over", "Ego" and a remix of "One Shot" (so I suppose my dreams of that also becoming a single should dim as well). Headlines is backed by their current single on rotation, "Missing You". While the song is pretty to be sure, it is continuing The Satz downhill slant into Hot AC territory with yet another mid-tempo sparkler. Technically you could put both Wordshaker singles into that category, as well as their Comic Relief cover of Depeche (Freakin'!) Mode's "Just Can't Get Enough" and the surprising Goliath that was "Issues" of their debut album, Chasing Lights. Their last proper dancefloor stomper was "Work", and we all know what an undeserving disappointment that was in the UK charts (for shame, England! For shame! It's almost as criminal as the ranking of Mini Viva's "One Touch!"). 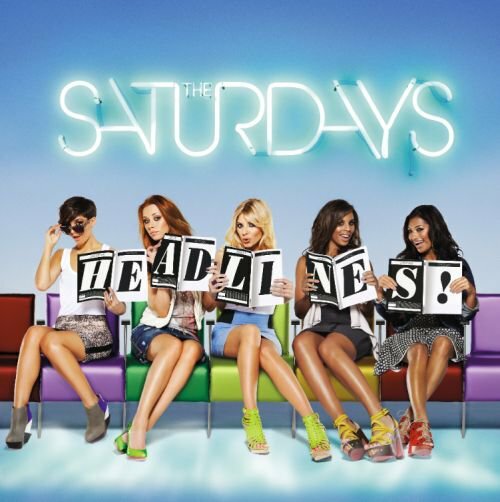 I'm not quite sure when but somehow, when we were all sleeping or perhaps during the time difference between London and New York maybe, The Saturdays have decided to re-present themselves. Not as the new Girls Aloud with a dance-floor twist as the originally wanted to be, but as the poster children (literally) for a sound that hardly fits with their age group. Perhaps I'm bitter. I won't deny it. I will always root for the girls Satz, and am looking forward to Headlines. I'm hoping all five new tracks blow what I loved about Wordshaker out of the water, because that's the way musical progression should be. 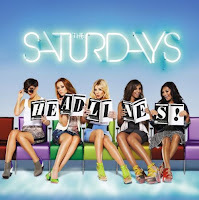 But a part of me is starting to wonder if this is the direction The Saturdays should be heading in. "Missing You" gets better with every listen, but it's no "Wordshaker" and it comes nowhere near close to giving me the excitement that "If This Is Love" or "Up" did two years ago. Strange, considering all chief Brit competition has gone out the window, what with yet another year without new Girls Aloud material and the spontaneous (okay, maybe not so spontaneous) combustion of Sugababes. One could say, the musical landscape is always changing, and with the strength of solo female Brit nouveau now being en vogue (a la Ellie Goulding or Marina & the Diamonds or Florence & the Machine or Insert Name Here), former strategies must change. Still, the path to Brit Girl Group Queendom is wide open, and yet the UK's best competitor just tepidly puts their foot in the water and says, 'Meh, okay, we'll try.' It sounds downright illogical to my ears. And yet, with "Missing You", it's all about longing for the tumult of a past (and by the sounds of it unhealthy) relationship. "Where's the pain when you walked out the door?/It doesn't hurt like it used to before...Where's the thrill at the end of our fights?...I just miss all the mess that we made/When we still had the passion to hate...I miss hurting you til you cried/I miss watching you as you tried/Tried not to end up in tears/Begging to get back together/I just want you to be/To be stuck in this second forever/So don't freak out if I leave." Perhaps I'm taking it too literal (shock! ), but I find nothing empowering in this blatant lyrical masochism. I hardly find it a "bittersweet ode to lost love". It's mostly just depressing, depressing, dreary set to epic synth chords. Until I put it in perspective and realize I can relate. I do "Miss Missing You", the Saturdays. I miss the thrill of the underdog. I miss the thoughts of potential. Because if this is all I have to look forward to, then I'm kind of looking backward, aren't I? Let's put it this way...I dislike this song less than I did when it first surfaced. The Hot AC description is very appropriate, but they aren't really innovators to begin with, are they? Having said that, Fascination's top brass need to be taken out to a club, the beach and a school dance so they can get a clue about what's going on with music currently. Hits are sitting under their noses (Sats, Alphabeat), and they can't seem to muster the skill to promote them. Great writing, Mel. Really, great. I agree that they're heading in the wrong direction in a time when the UK girl group crown is up for the taking. "Missing You" isn't, in my ears, an awful song, but it's far less exciting than a good number of songs they've released before. I think I like "Ego" more than you do, but "Wordshaker" is great as well.